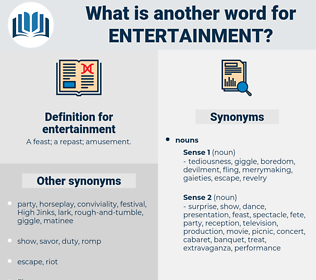 What is another word for entertainment? A feast; a repast; amusement. Institutes, relaxation, comfort, cinema, diversion, 'animation, music, maintenance, spectator. 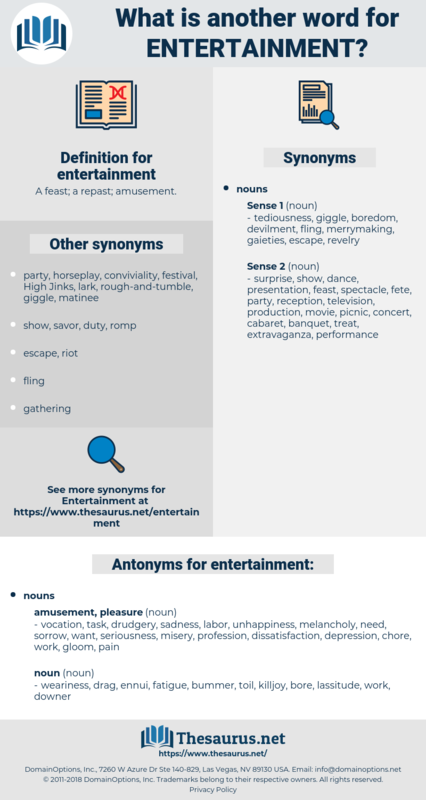 enjoyment, entertainer, distraction, animation, gaming, leisure, pastime, theater, showmanship. vocation, task, drudgery, sadness, labor, unhappiness, melancholy, need, sorrow, want, seriousness, misery, profession, dissatisfaction, depression, chore, work, gloom, pain. toil, drag, killjoy, bore, fatigue, lassitude, ennui, bummer, weariness, downer. The " Enterprise" was a newspaper, but it was willing to furnish entertainment even at the cost of news.
" They told me dinner was served," said Lady Culduff, angrily, as she entered the room, dressed as if for a court entertainment; " and I hurried down without putting on my gloves." distraction, extravaganza, show, edutainment, beguilement, nightlife, night life, militainment.